It is imperative to build a long-term sustainable climate policy when provinces change leaders, parties and ideology, every few years. We are in a country, where a substantial number of its population say they're not convinced that human and industrial activity is causing climate change. According to a recent Abacus Data poll, one in every three Canadians does not believe in science that supports climate change. There should be nothing to deny climate change when the evidence is crystal clear. Summer has been a scorcher all over Canada with devastating drought and wildfires. The hot and dry weather has worsened fires across British Columbia. Earlier this year, thousands of residents were forced from their homes in B.C. due to historic flooding. Although the evidence is clear with catastrophic ramifications, there is still widespread disagreement on climate change. How much we all agree about climate change is extremely important because it plays a significant part in how the government takes action to combat climate change. Flood waters from Kettle River are shown flowing into Rock Creek, B.C., on May 17, 2018. Climate action policies see a lot of reversals as pressure from climate deniers builds up. Contrary to popular belief, democratic governments need the political will to address the problem. For example, a lack of political will has led to Ontario's clean energy rollback, weak commitments in the Paris Agreement and the Pan-Canadian Framework on Clean Growth and Climate Change. Pressure from sizeable anti-tax groups, the oil and gas industry and climate change deniers have forced the government to the cancellation of Ontario's Electric and Hydrogen Vehicles Incentive Program and the Electric Vehicle (EV) Charging Incentive Programs. In my opinion, such measures damage the climate promises we made to the international community. We must remember Canada is an alliance partner of an ambitious coalition along with dozens of countries that pledged to intensify decarbonization efforts. For quite a long time now, we have been listening to the voices from the government about GHG reductions while making no significant efforts to keep the promises we made to the international community. While federal government delays climate action after oil patch lobbying, provincial governments are adhering to the narrow economic interests of a small number of large businesses. Currently, B.C. is showing a certain amount of leadership in supporting sustainable climate policies like the clean energy vehicle incentive program and the carbon tax. Will these policies stand the test of time when the regime changes in the next few years? Therefore, it is imperative to build a long-term sustainable climate policy when provinces around Canada change leaders, parties and ideology, every few years. While democratic governments are yielding to the pressures of climate change deniers, we need to answer whether democracy in Canada is up to the challenge of climate change at all. Canadian democracy is not a natural ally of the bold decisions required to combat climate change. If we compare two different authoritarian states in dealing with climate issues, Singapore and China. The former is lauded for successfully managing its urban environment and has therefore praised for an authoritarian form of governance for dealing with environmental problems. On the other hand, China has been praised for its progress in rapidly adopting green technologies. China's system has made it a global leader in renewables. But is it required to choose between social justice and saving the planet? Rather than jumping to authoritarianism, one should reframe the question: how to strengthen democracy so we can rise successfully to the climate challenge? 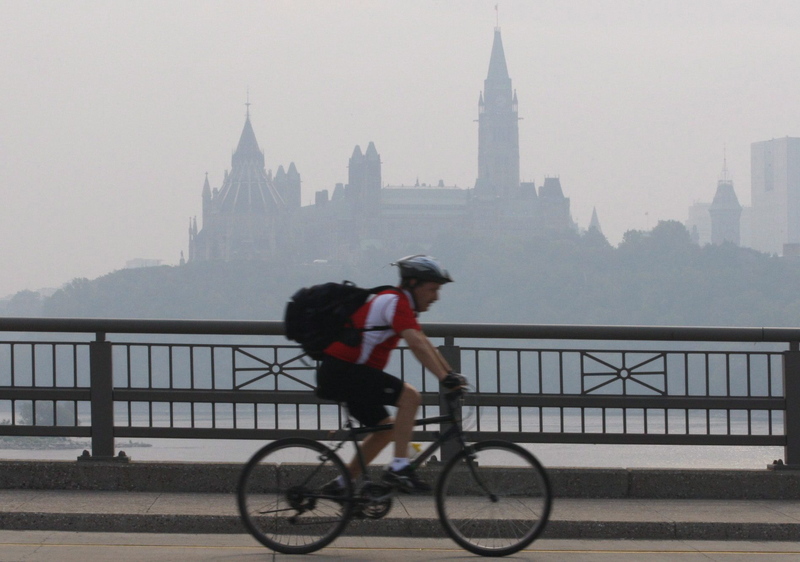 A cyclist make his way across a bridge into Ottawa as the Parliament buildings are seen through haze in Ottawa, Canada on May 31, 2010. The very nature of democracy is that leaders are reluctant to burden business with extra costs on emissions and other best environmental practices, fearing they are voted out of office. These economic externalities impact the Canadian public, and disproportionally impact First Nations, Canada's northern communities, and those living in drought and flood prone areas. Canadian democracy is not a natural ally of the bold decisions required to combat climate change. However, the effects of climate change in Canada, in the form of severe wildfires, devastating droughts, and widespread floods, are already being felt. And Canadians whose lives are jolted by climate change are beginning to demand prompt action, effectively forcing politicians to implement sustainable policies. As a result, in a democratic system, people will be the first to vote their leaders out of office when the damaging effects of climate change start hitting home. Canada has the best democracy index in the world. Nevertheless, Canada has failed to adopt a national strategy for combatting climate change. It is not that democratic countries have not taken bold decisions. For example, several countries have announced a future ban on the sale of new gasoline and diesel cars. Ireland, Netherlands, Germany, and India announced a ban by 2030. Numerous countries have a carbon tax or cap and trade system. What is required for Canada to become fully engaged in the fight to combat climate change? Enact stronger environmental protection laws so that human right to a clean environment necessary to health and well-being is guaranteed. The problem with these suggestions is that the timeline for implementing them is rather long, while the impact of climate change is imminent. Ultimately, a democracy is a government with power vested in the people. As Canadians, we need to demand these changes that are urgently needed.